PHUKET: Phuket Police are investigating the mysterious death of a 27-year-old Nakhon Sri Thammarat man found dead in his pickup truck parked by the side of a road yesterday. 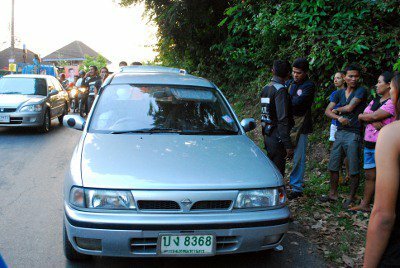 The body, identified by police as that of Phumin “Min” Inthongkham, was found at about 6pm in his Nissan NV pickup parked along Rassadanusorn Road, near the border of Rassada and Phuket Town. By the time Kusoldharm Foundation rescue workers and Phuket City Police arrived at the scene, a large crowd had gathered around the Bangkok-registered vehicle. Police estimated that Mr Phumin died at about midday yesterday. His body was discovered by Rattikarn Khongchu, a 29-year-old cleaner and neighbor of Mr Phumin. “I was passing on my motorbike when I noticed the pickup parked on the side of the street with Min inside. He looked like he had fallen asleep and left the door unlocked, but when I opened the door I realized he was dead, so I called the police,” she said. Questioning of nearby residents revealed that the pickup had been parked there for about six hours. “Nobody really paid attention to it until his neighbor passed by and discovered he was dead,” said duty officer Sodarak. Initial examination suggested the cause of death as suffocation, perhaps from falling asleep in the vehicle with all the windows shut in the midday sun, he added. Capt Sodarak suggested that Mr Phumin might have pulled over to sleep and left the engine running with the air conditioner on, but suffocated when the engine stopped. Another neighbor at the scene said Mr Phumin worked as a sales representative for a company that sold anti-rust spray. “He had been drinking a lot lately, ever since he had a problem with his wife that led to their separation,” he said. “Min had a four-month-old child with his wife. He rented a room in the housing estate and lived alone. He returned from a visit to his hometown in Nakhon Sri Thammarat a few days before he died,” he added. Police consigned the body to Kusoldharm Foundation rescue workers for transport to Vachira Phuket Hospital, where doctors will conduct an examination in order to try to determine the cause of death.